Sám autor mapy situaci komentuje v levém horním rohu: „Black Octpus´ is a name newly given to Russia by a certain prominent Englishman. For the black octpus is so avaricious, that he stretches out his eight arms in all directions, and seizes up every thing that comes within his reach. But as it sometimes happens he gets wounded seriously even by a small fish, owing to his too much covetousness. Indeed, a Japanese proverb says: "Great avarice is like unselfishness". We Japanese need not to say much on the cause of the present war. Suffice it to say, that the further existence of the Black Octpus will depend entirely upon how he comes out of this war. The Japanese fleet has already practically anihilated Russians naval power in the Orient. The Japanese army is about to win a signal victory over Russia in Corea and Manchuria. And when... St. Petersburg? Wait and see! The ugly Black Octpus! Hurrah! Hurrah! For Japan. 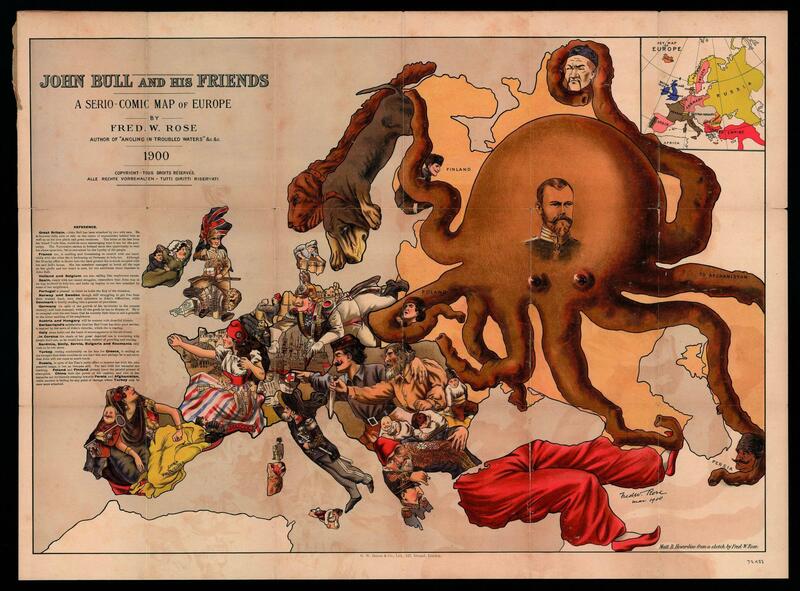 This cartoon-map gives a satirical take on the events of 1877 - a volatile year in Europe. Political caricatures, shaped around the individual nations, bring this story to life. The illustration uses an outline of Europe as the framework for presenting its political comment. It assumes that its readers will recognise this shape and identifythe countries within. Fred W. Rose is synonymous with this type of political cartoon map. It´s style, however, is part of a long tradition of anthropomorphic maps (drawn to resemble generic national types) and zoomorphic maps (drawn to resemble real or mythical animals). Letting pictures tell a story has proven to be a very powerful weapon. 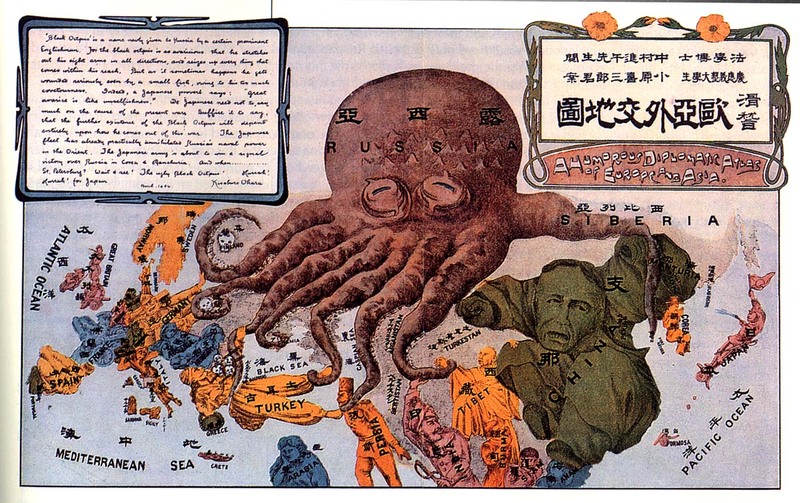 Twenty five years after the Octopus Map was first published, it was used again by Japanese propagandists to win European support against Russia during the Russo-Japanese war. 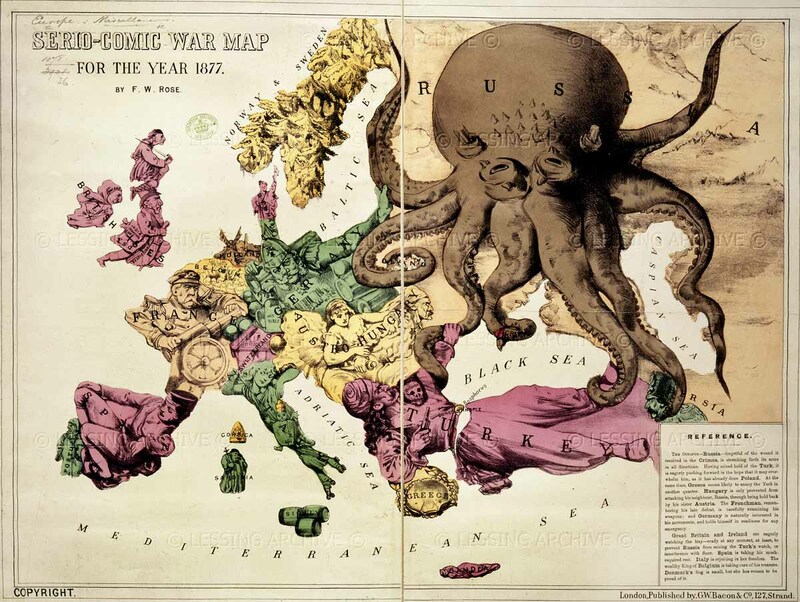 The Octopus - Russia, forgetful of the wound it received in the Crimea, is stretching forth its arms in all directions. Having seized hold of the Turk, it is eagerly pushing forward in the hope that it may overwhelm him, as it has already done Poland. At the same time, Greece seems likely to annoy the Turk in another quarter. Hungary is only prevented from assisting his neighbour, Russia, through being held back by his sister, Austria. The Frenchman, remembering his late defeat, is carefully examining his weapons; and Germany is naturally interested in his movements, and holds himself in readiness for an emergency. Great Britain and Ireland are eagerly watching the fray - ready, at any moment, at least, to prevent Russia from seizing the Turk´s watch, or interference with Suez. Spain is taking his much required rest. Italy is ruthlessly making a toy of the Pope; and the wealthy King of Belgium is taking care of his treasure. Denmark´s flag is small, but she has reason to be proud of it. Rose´s 1877 map is very similar to the 1900 one. But while Russia still is the offending protagonist, tentacling its way into its neighbours´ affairs, the nature and direction of some of the anthropomorphic nations has changed, reflecting an altered political landscape. Whereas France in the 1877 map is an old general aiming cannon at Germany, still frustrated by its recent defeat in the Franco-Prussian war of 1870-71, France in 1900 is Marianne, dressed in the revolutionary colours, looking away from Germany, and toward Britain. France too, is scolding and threatening to scratch with one hand, while with the other she is beckoning on Germany to help her. Although the Dreyfus affair is thrust into the back-ground she is much occupied with her new doll´s house. She has somehow managed to break all the toys on her girdle and her heart is sore, for she attributes these disasters to John Bull. Norway and Sweden though still struggling to get free from their mutual leash, turn their attention to John´s difficulties, while Denmark is kindly sending him a present of provisions. Austria and Hungary will be content with dreadful threats. Switzerland´s satisfaction that her Red Cross has done good service, is marred by the news of John´s victories, which she is reading. In Corsica the shade of her great departed son is wondering why people don´t act, as he would have done, instead of growling and cursing. Russia, in spite of the Tzar´s noble effort to impress her with his own peaceful image, is but an octopus still. Far and wide her tentacles are reaching. Poland and Finland already know the painful process of absorption. China feels the power of her suckers, and two of her tentacles are invidiously creeping towards Persia and Afghanistan, while another is feeling for any point of vantage where Turkey may be once more attacked. Original size of the map is 28 × 20 inches.